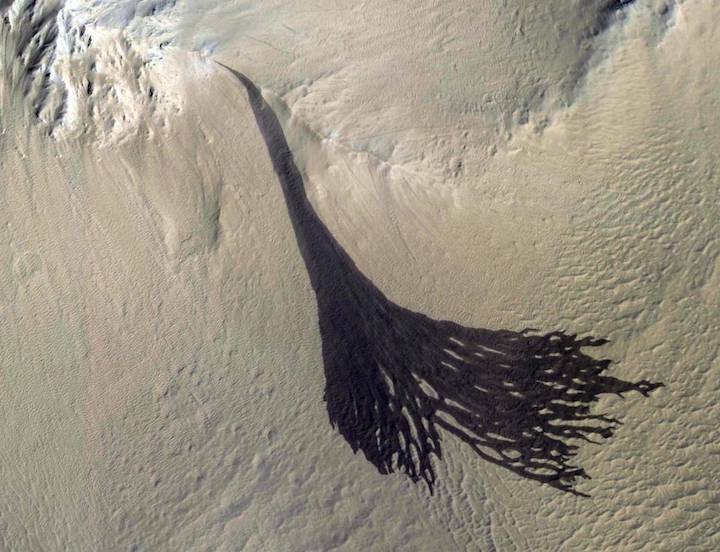 This image from NASA's Mars Reconnaissance Orbiter (MRO) shows streaks forming on slopes when dust cascades downhill. The dark streak is an area of less dust compared to the brighter and reddish surroundings. What triggers these avalanches is not known, but might be related to sudden warming of the surface. These streaks are often diverted by the terrain they flow down. This one has split into many smaller streaks where it encountered minor obstacles. These streaks fade away over decades as more dust slowly settles out of the Martian sky. The map is projected here at a scale of 25 centimeters (9.8 inches) per pixel. [The original image scale is 28.1 centimeters (11.1 inches) per pixel (with 1 x 1 binning); objects on the order of 84 centimeters (33.1 inches) across are resolved.] North is up.